The Peculiar Tale Of The Prince Of Bohemia And The Society Of Desperate Victorians will kick off The 14th Annual Goodspeed Festival of New Musicals in January 2019. With book and lyrics by Becca Anderson and Dan Marshall and music by Julian Blackmore, the show is based on a series of short stories by Robert Louis Stevenson. When Prince Florizel learns that his father the King of Bohemia is dead, he seeks to escape the throne. He and his chaperone Colonel Geraldine are invited to join a secret society - The Suicide Club. Club members play a deadly card game nightly with higher stakes than the Prince has ever known. Realizing the deck is stacked against them, the Prince and Geraldine become inextricably linked to the club's members in this darkly hilarious new musical. For more information about the festival and the show, CLICK HERE. 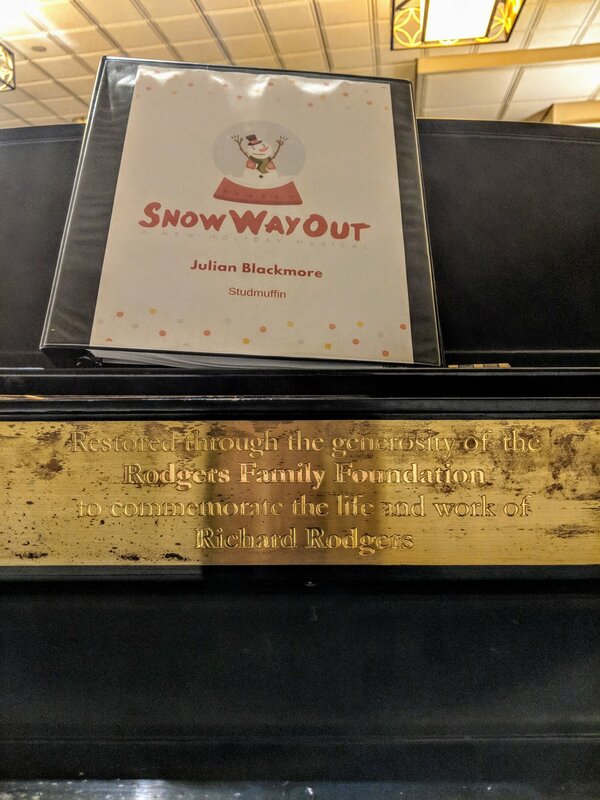 Last week saw an unseasonal reading of a new draft of my holiday show 'Snow Way Out', featuring the wonderful talents of Maya Maniar, Colin Miyamoto, Jason Eno, Sarah Pesek, and Robert Johnson. The reading was presented in the beautiful Mary Rodgers Room at the Dramatists Guild as part of the Friday Night Footlights series. We had a full house, a lot of laughs, and walked away with some great insights into the piece. Thanks to everyone who came! Playing on one of Richard Rodgers' old piannahs! After a couple of years of mulling ideas over my writing partners and I have finally dived in to the first draft of a new show! 'Heist' is based on the true story of the 1972 New York hotel robbery that was the largest jewelry heist in history. Who was Bobby Comfort, and why did he do it? Find out why just as soon as we've finished writing the show. In the meantime check out a few songs from the show below. Academia Nuts got a very generous name check by the lovely folks at Hypable.com in a recent article about how geek culture is driving current theatre trends. "The Cursed Child announcement certainly linked the worlds of page and stage forever. But a more perfect harbinger of things to come was a little show that debuted at the New York Musical Festival in 2014 called Academia Nuts." Thanks, Hypable! Read the full article here. Tonight is opening night for a brand new production of 'Spandex' at the Minnsky Theatre in Minneapolis. While I sadly can't be there as I am traveling I want to say a big thank you to all the cast, crew, and creatives for all their hard work in putting this production together. Break a leg and stretch it out! Anyone interested in seeing the show, which runs to June 10, can get tickets here. The cast of 'Spandex' in the original 2013 production. Last week saw a group of talented actors get together around a table to stumble through a reading of the latest draft of 'Spandex'. As the authors we were trying out some new songs, story lines and general re-jigging of the plot. Thanks to everyone involved for lending us their time and energy! Watch this space for more Spandex developments in the near future!